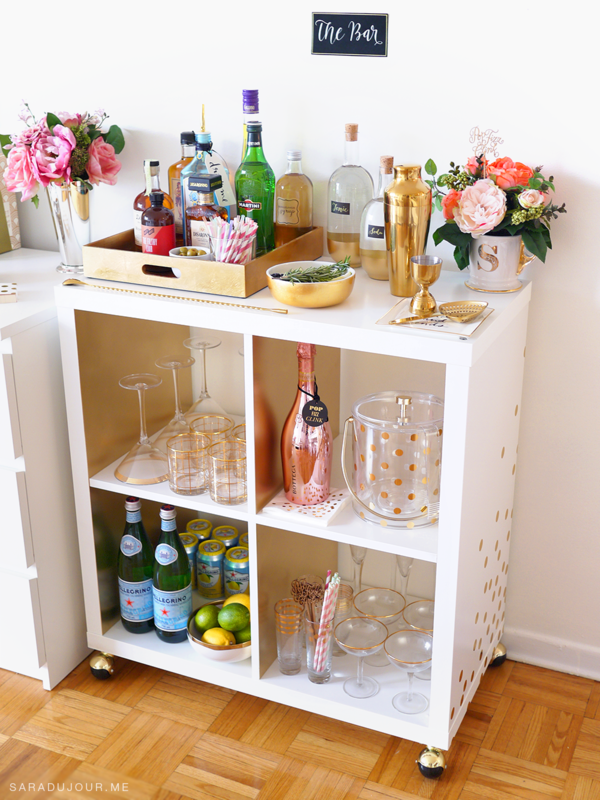 Bar carts seem to be popping up everywhere lately, and if you follow me on Pinterest, you know I’ve had my eye on them for quite a while now. 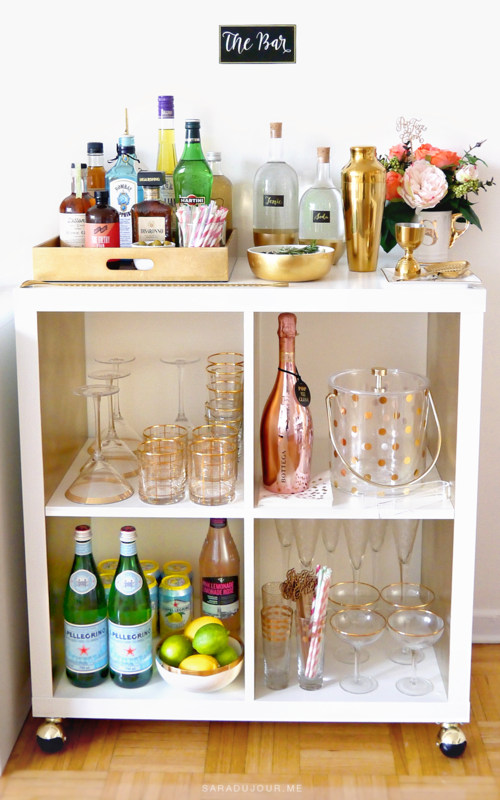 I managed to get my own bar cart ready just in time for holiday entertaining. 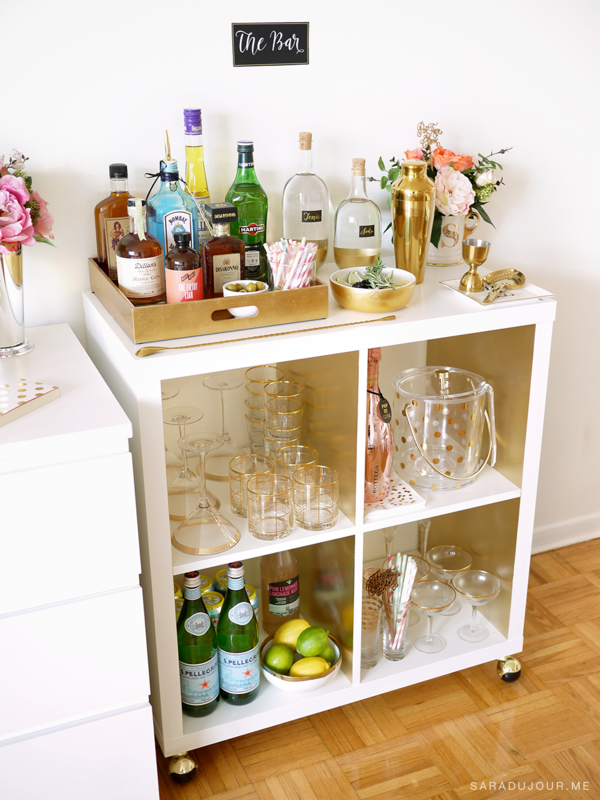 This project was truly a labour of love, from picking out each item, to planning the design of the cart, and finally, actually building the DIY bar cart itself. I am pleased to say that I now have a bar cart in my apartment, and I can’t wait to share all the details with you. 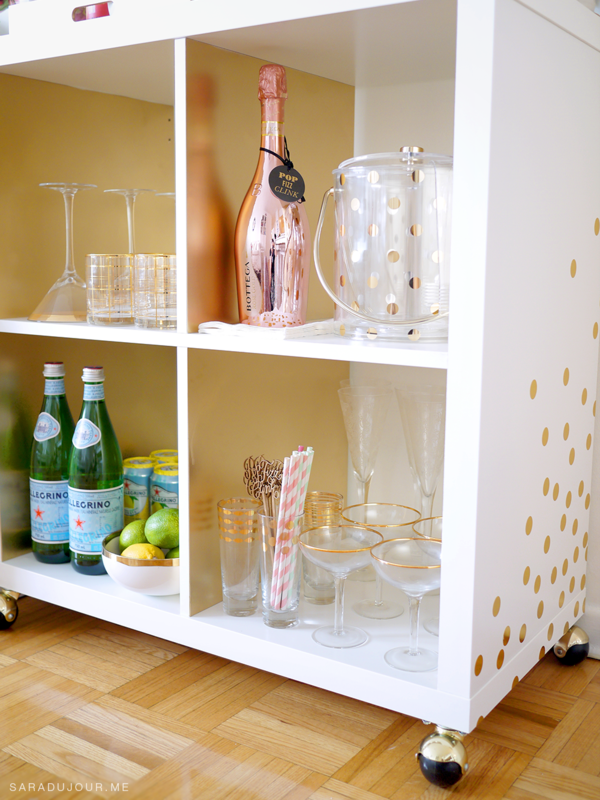 If you’re interested in learning how I made this white and gold IKEA hack bar cart, read my DIY post. 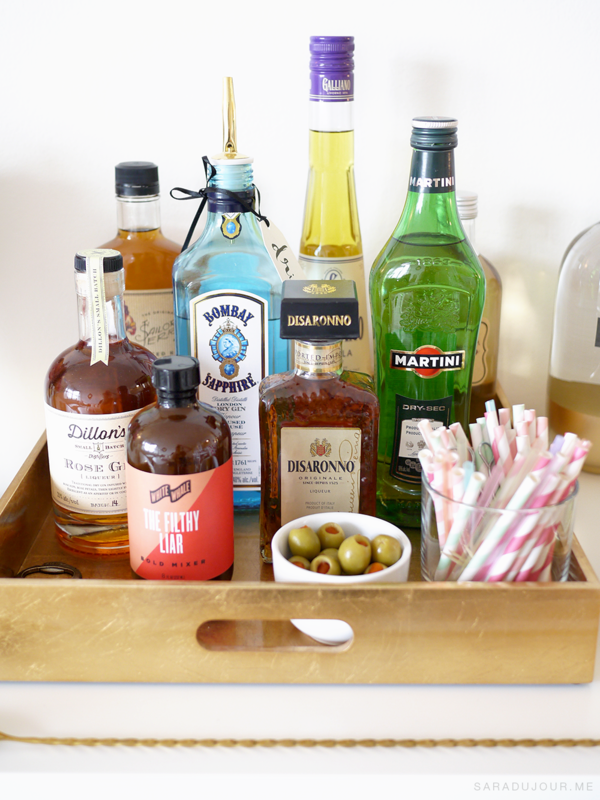 Keep reading if you want to learn everything you need to create your very own bar cart, from which drinks to choose, to having the right glassware on hand, stocking the right bar accessories, and more. I’ll put links throughout to everything you see here, to make it easy to shop if you’re building your own. 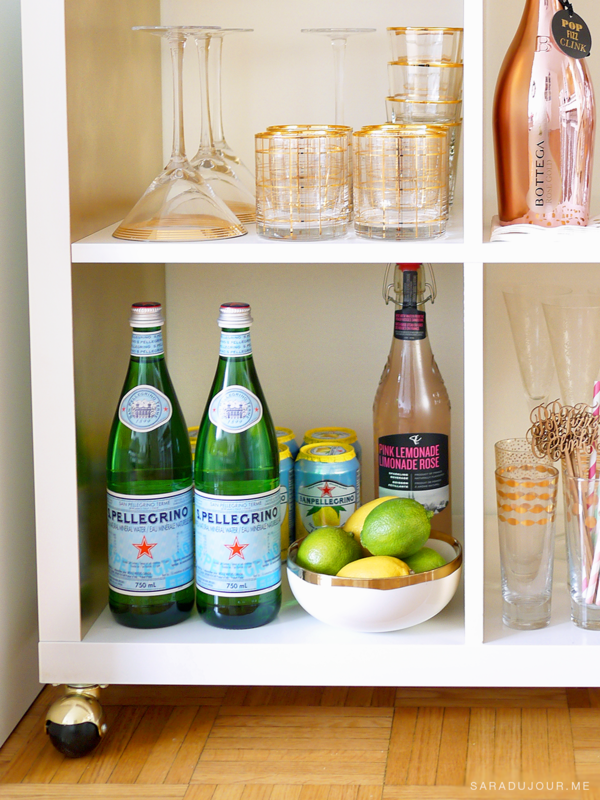 I tried to stock my bar cart so that the most commonly used items are the easiest to grab. Stuff like the alcoholic drinks, basic mixers, and garnishes. Rarely used glassware, like champagne flutes, could afford to be a bit beyond reach. 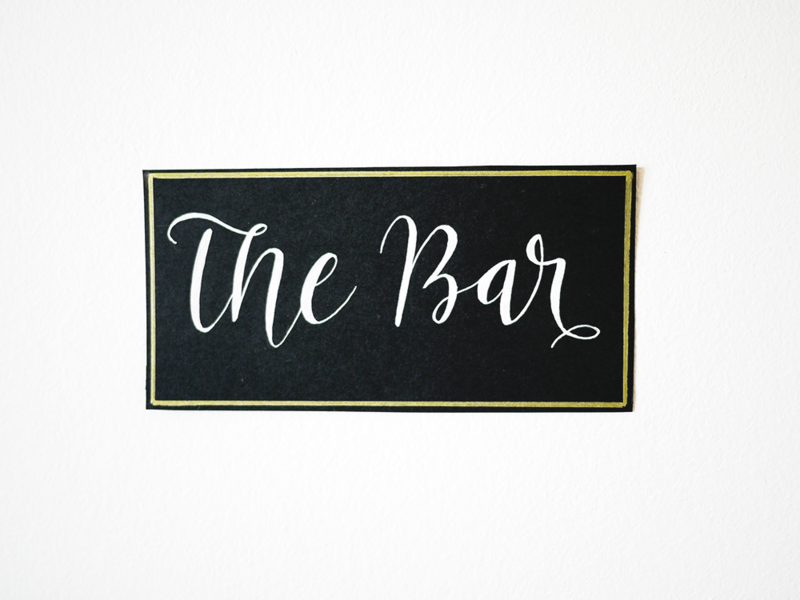 I knew I wanted a hand-lettered bar sign to tie it all together, and my lovely and very talented friend Sarah did a beautiful job of it. I gave her an example of what I was hoping for, and she far exceeded my expectations. If you want to enlist Sarah’s services for yourself, she has an Etsy shop. You can also follow her on Instagram to marvel at her mad calligraphy skillz. 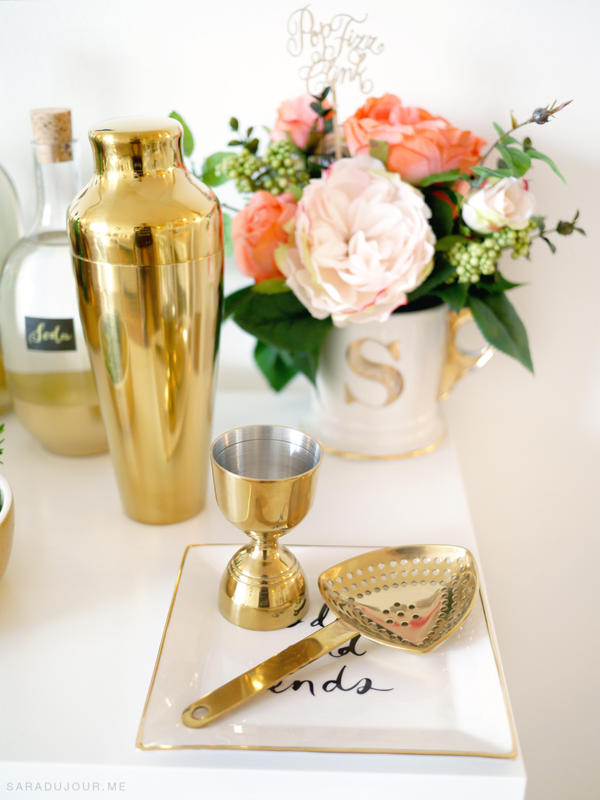 But no matter how beautifully styled a bar cart is, it’s only as good as its goods, really. So let’s get into what I chose to stock my home bar with. I’m primarily a gin drinker, so my bar cart is heavily skewed towards gin-based cocktails. 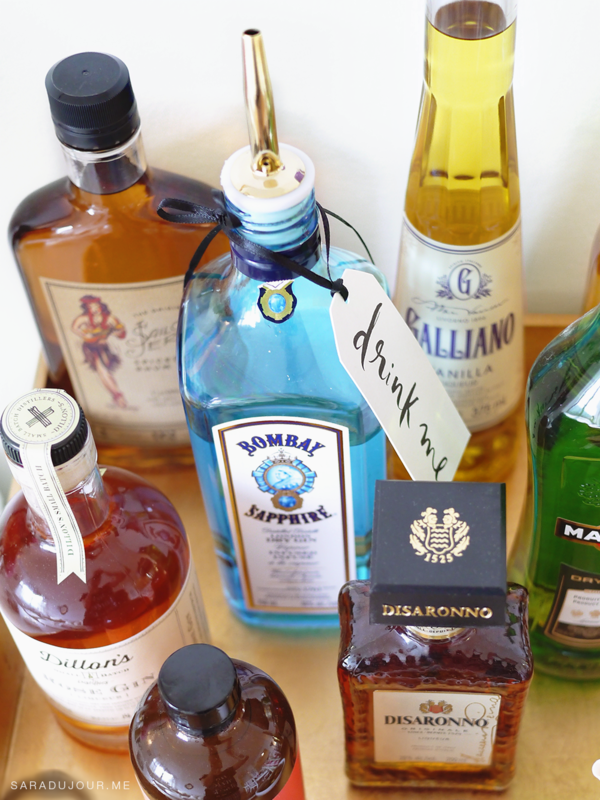 In general though, it’s good to have a selection of liquors for guests to choose from, the basics being gin, vodka, rum, tequila, whiskey, and vermouth. In addition to the liquors, I have a couple of syrup-based cocktail mixers to spice things up, as well as colourful cocktail straws (both paper and plastic), stainless steel cocktail picks, and stuffed olives for martinis. White Whale make a collection of bold mixers designed to combine well with various spirits. The flavour I chose, called The Filthy Liar, is made with lychee, lime, and clove, and is meant to go really well with – you guessed it – gin. 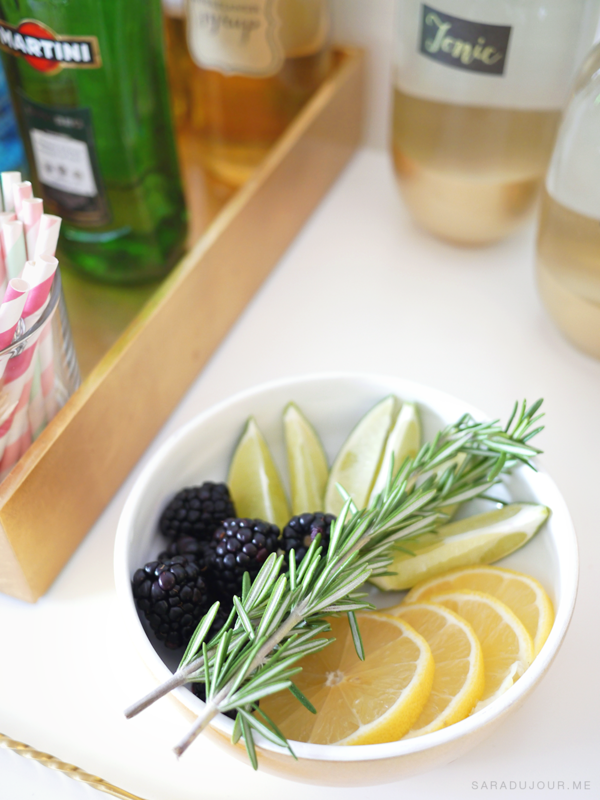 Garnishes are a great way to add both beauty and flavour to a drink, so it’s nice to have a selection available for your guests to choose from. Lemon and lime wedges are staples, but since I designed a menu of custom cocktails for my party, I tailored the garnishes to suit those drinks. 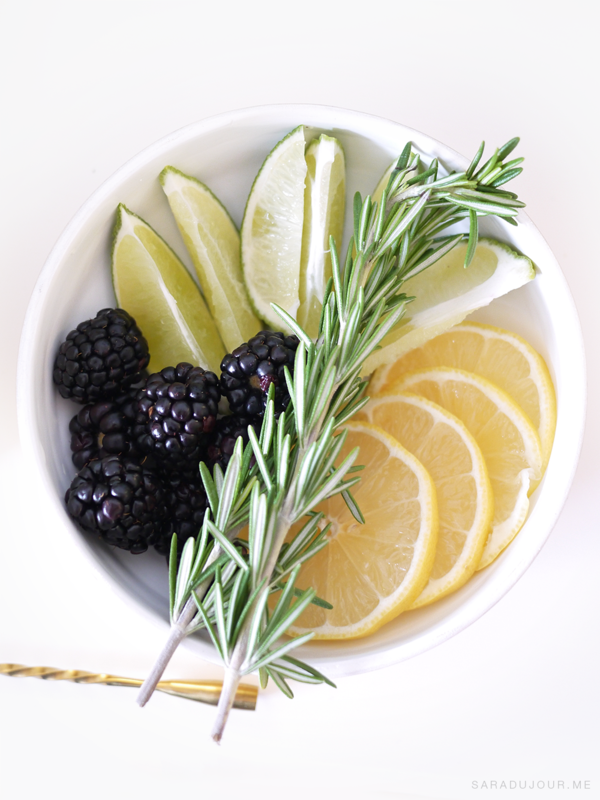 In addition to lemons and limes, I like to have some sort of berry and some kind of herb, in this case blackberries and fresh rosemary. You can buy these gold cocktail accessories individually, but I managed to get a great deal on the whole set (the gold cocktail shaker, bar spoon, strainer, liquor pourer, and jigger) on Ebay. Sodas are an important component of any home bar, but if you’ve gone through all the effort of carefully styling your bar cart, it’s unlikely you’ll be happy about plopping a few bottles of store-bought soda on there. Instead, I transferred their contents into pretty glass bottles with cork stoppers, and labelled them for ease of use. 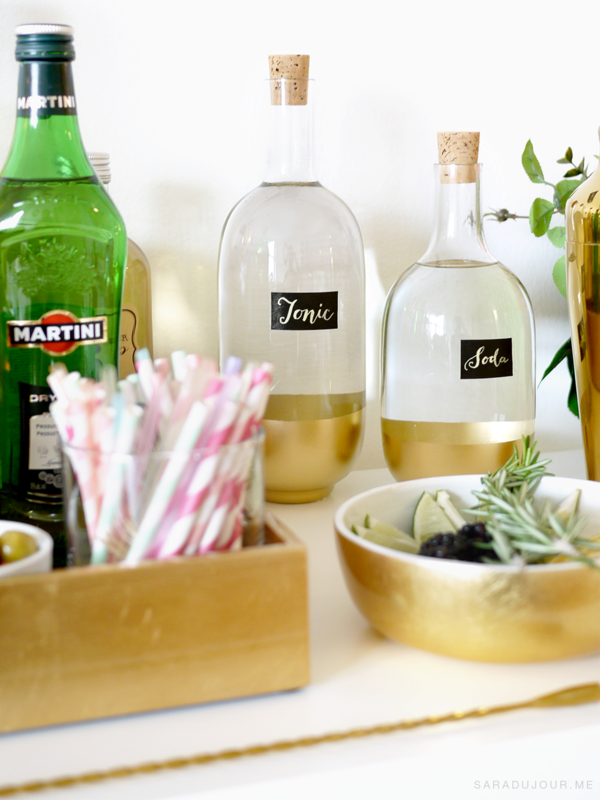 Learn how to make these affordable, DIY gold-dipped glass bottles here. For the labels, I cut out pieces of chalkboard stickers from IKEA, and used a thin gold marker to hand-letter each name. 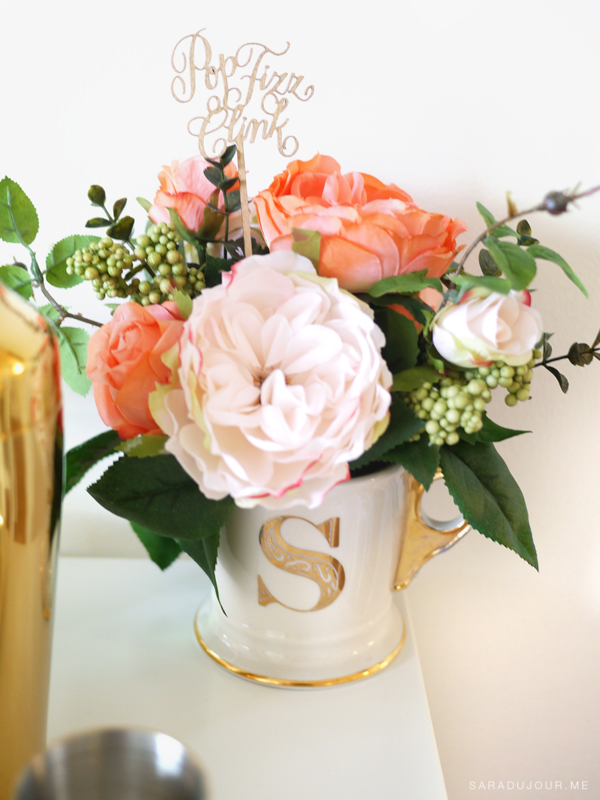 I love flowers, and though I can’t yet afford to have my home adorned with fresh flowers constantly, silk flowers are a wonderful way to add a beautiful pop of colour to your home without having to refresh them weekly. If you’ve actually stuck around and are still reading, thanks! 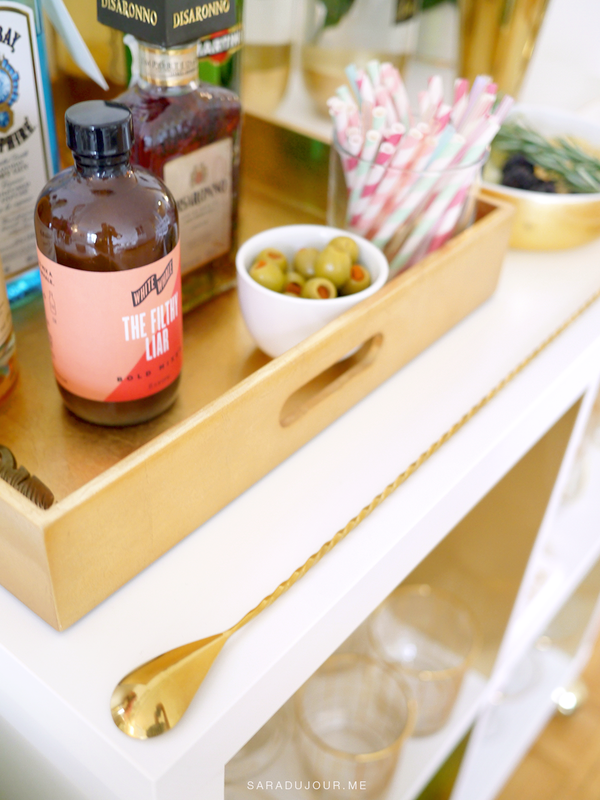 Now that we’ve covered what’s on my bar cart, let’s talk about what’s in it. 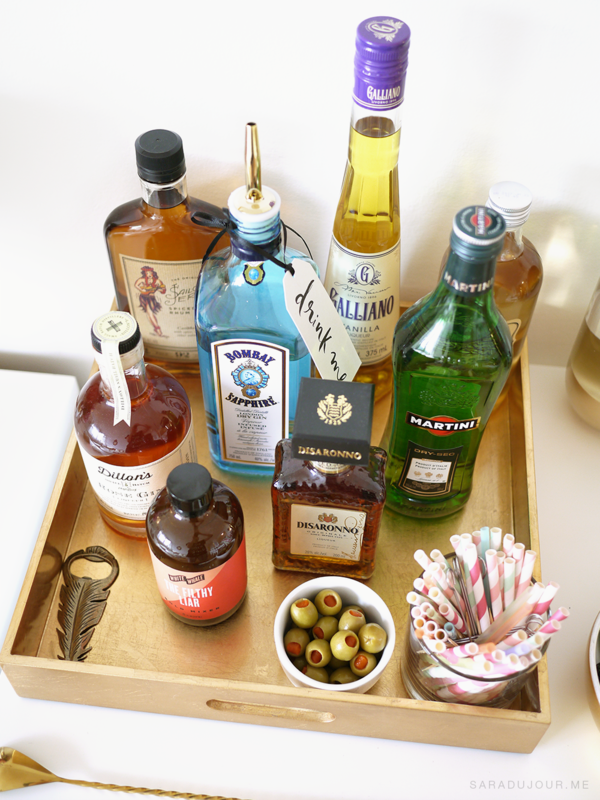 Here are the rest of my bar cart essentials. Glassware is, of course, essential – and a bar cart is a great way to display any pretty glassware you might have collected. 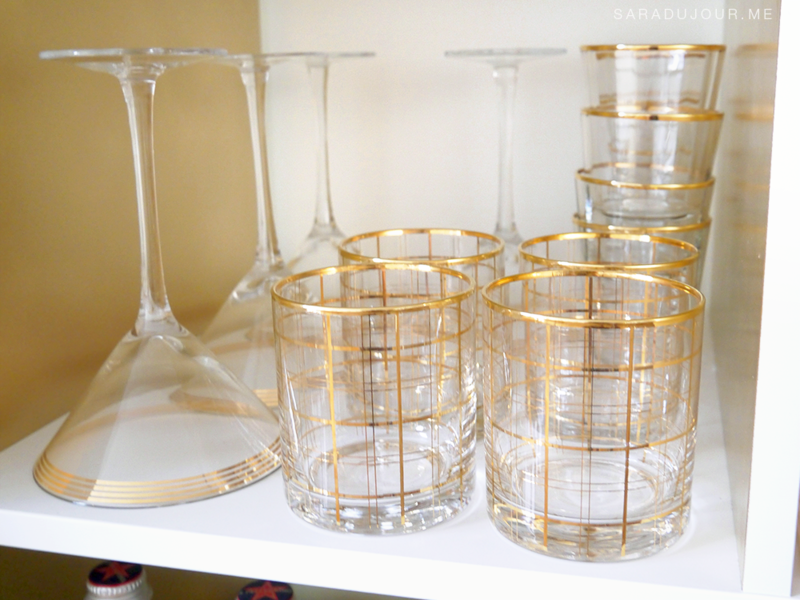 Your most-used item of glassware will likely be your lowball glasses, so I put those front and center. They’re great for various cocktails as well as straight liquor on the rocks. Beside them sit my gold-rimmed martini glasses, my second-most used glassware type. In the bottom-left compartment, I keep extra mixers, like sparkling water, pink lemonade, and cans of San Pellegrino Limonata. Not only can these be used in cocktails, but they’re also great to have on hand for any guests who choose not to drink, or can’t because they’re busy growing little humans. I also keep extra lemons and limes in a bowl, both for decor and in case my pre-cut citrus wedges get snatched up faster than expected! 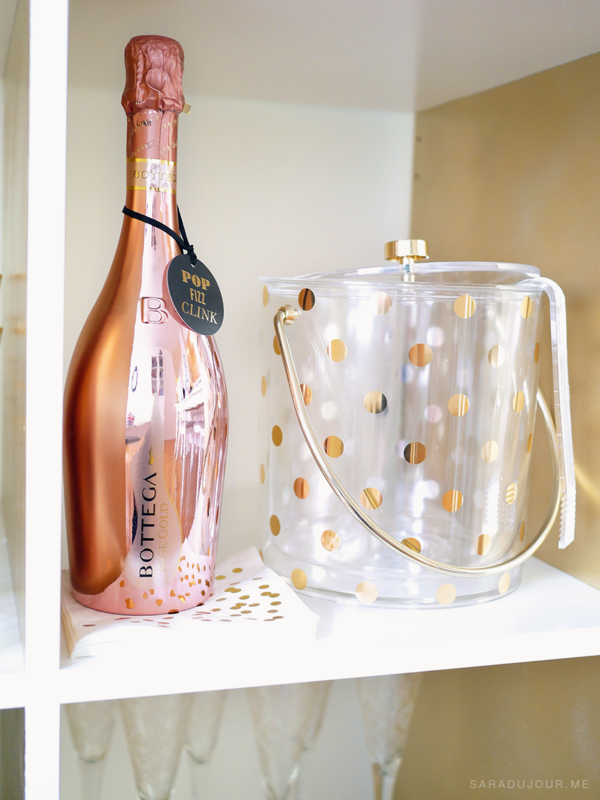 In the top-right compartment of my bar cart, I keep my Kate Spade New York gold dot ice bucket, matching gold dot cocktail napkins, and a bottle of rose gold bubbly, ready for any impromptu celebratation. 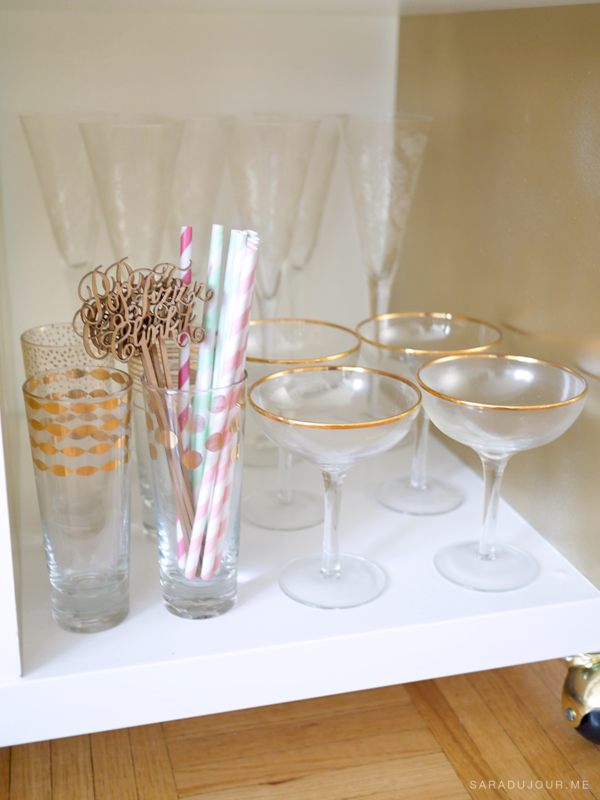 And finally, in the last compartment, I keep various types of champagne glasses (stemless, flutes, and gold-rimmed coupe glasses), as well as a few decorative cocktail accessories, like colourful striped paper straws and gold, cut-out calligraphy wooden drink stirrers. 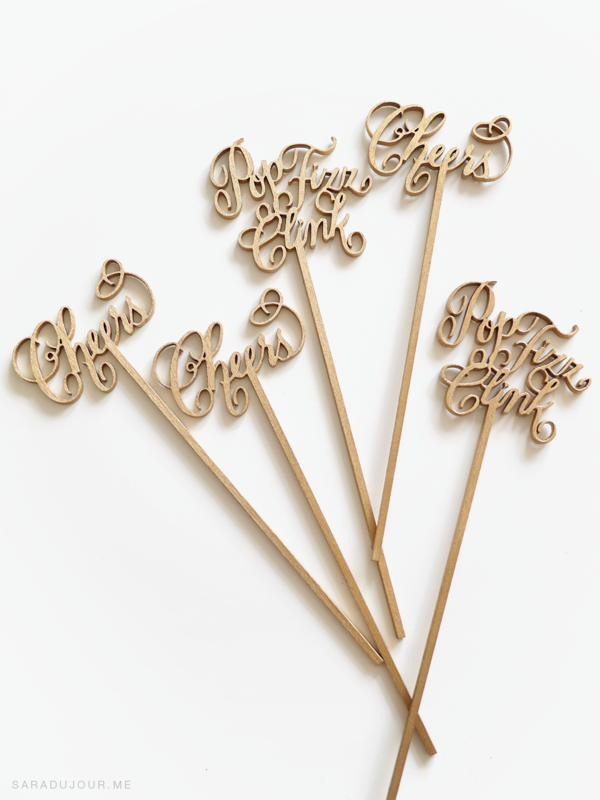 These drink stirrers are from Laura Hooper Calligraphy on Etsy – they’re gorgeous and golden (my favourite) and can be gently washed and used again and again. 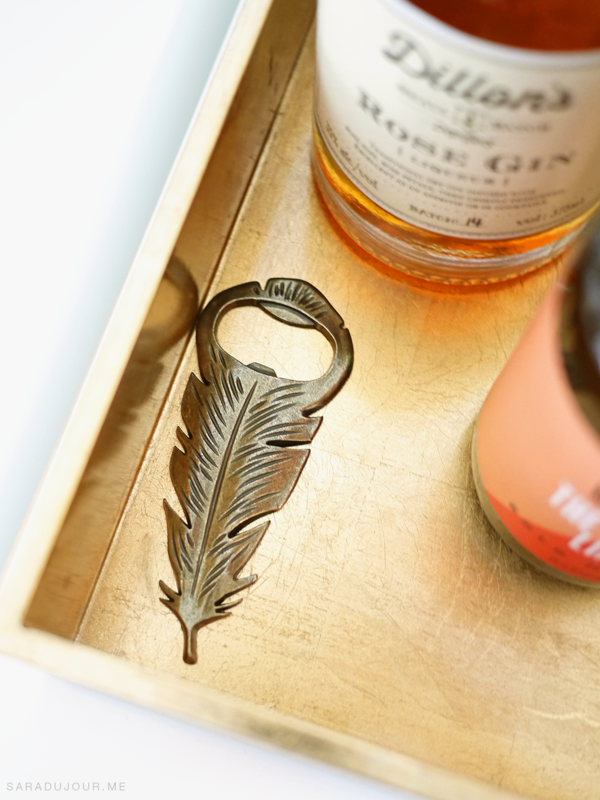 And that (finally) concludes my list of bar cart essentials. 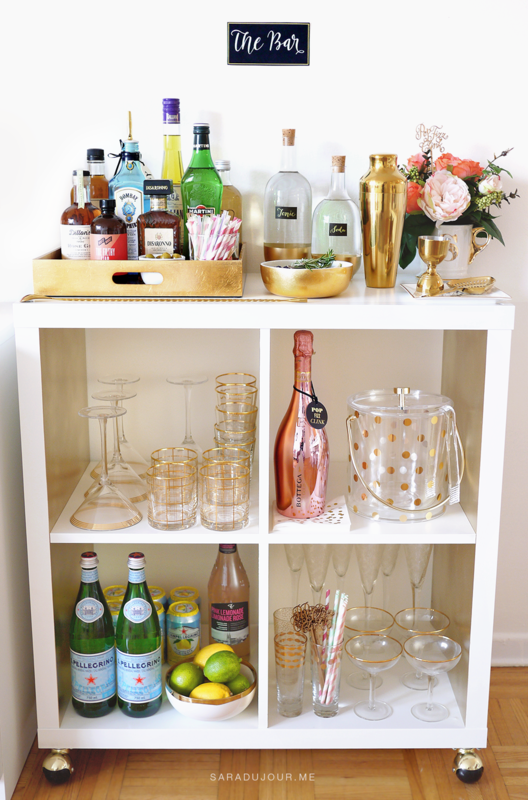 If you have a bar cart, I want to see how you’ve styled it! Snap a pic and tag me on instagram (@Saradujour). I absolutely love this!!! Such a beautiful bar cart! I love this bar cart! I’m a little late on finding it so all the glassware is old and out of stock. Do you have suggestions and new ones?